The ewa-marine A-BM housing was specifically designed for the Blackmagic Cinema Camera and the Production 4k Camera. The housing is rated up to 10 meter depth or 33feet. 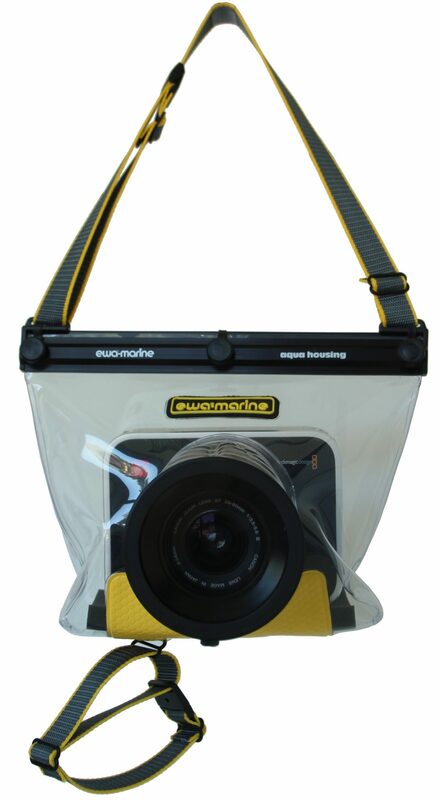 Designed specifically for these cameras the housing A-BM is manufactured from double laminated PVC film and has an integrated, optically neutral flat glass port. It is supplied in a yellow carry-case which has a water-proof interior. We offer custom A-BM housings which will allow the use of a lens with a maximum length of 160mm/ 6.3inches. Please give us a call or email us through our contact form on our website. For use of a Blackmagic Camera with lenses that do not fit the specifications above, we would have to do a custom housing with a larger front port (128mm Ø). Please let us know which lens you will be using, ideally with a link to the specs of the lens. We will manufacture a housing and supply it to you as soon as possible. Designed specifically forthe Blackmagic Cinema Camera and the Production 4k Camera, the housing A-BM is manufactured from double laminated PVC film and has an integrated, optically neutral flat glass port. With this housing you will receive a set of adapters that fit the filter threads of the most popular lenses on the market today. By means of this adapter the camera is then docked into the housings front port, ensuring that the lens remains parallel and centered behind the front of the lens. Just as if it were a clear, neutral optical filter.